In research commissioned by the African Development Bank (AfDB), ThinkWell studied civil society-initiated participatory governance methods across Africa, cataloguing the range of methods in use and factors that influence their effectiveness. Recent decades have seen a growing civil society engagement in government accountability mechanisms, which is often termed social accountability. However, social accountability mechanisms has somewhat limited what is considered civic participation. Restricting the scope of methods to those that hold the state accountable to something rather than the co-engagement of stakeholders to improve governance outcomes. ThinkWell is expanding the concept of social accountability to reflect the dynamic landscape of civic participation, going beyond accountable public officials to co-governed societies. 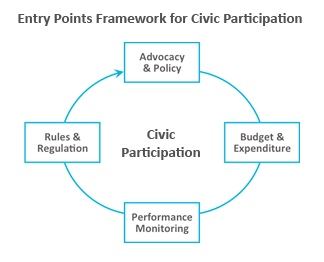 Participatory governance is when both state and non-state actors can meaningfully work together in the decision-making and operation of governmental systems. Participatory governance refers to democratic co-governance; where it is not one side against the other, but rather cooperation between them. Africa is arguably a region where the impact of nonresponsive governance continues to prohibit public service delivery and progress on human development goals. Moreover, each country has a unique socio-political context, which often restricts which sectors or issues citizens can engage in and how. In recent years, international support for participatory governance has risen dramatically, however there is a dearth of information about what participatory governance methods are being used, how they are being selected and what makes them work. ThinkWell used a team of researchers with diverse backgrounds, ranging from political science to public health, to conduct a comprehensive landscaping review of civil society-led participatory governance methods in Africa. Based on these findings, the team conducted key informant interviews with civil society organizations in five purposefully selected African countries (Ethiopia, Tunisia, Malawi, Mozambique and South Africa) to elucidate how participatory methods were being used and what factors influenced how they worked. The results from this study are working to shift the accountability paradigm. Firstly, we have captured the diversity of participatory governance throughout Africa, cataloguing over 200 projects. We identified 23 distinct methods, and have developed a new entry points framework, grouping each of them by where a citizen can engage. Based on the findings from the five country case studies we developed a political space analysis tool that links a country’s context and project objectives to method selection. The tool works by quantifying a country’s political space based on five key factors. These factors include required resources, capacity, openness, responsiveness and access to information.